One of F.O.R.C.E’s current goals which they have recently accomplished was getting House Bill, HB 3061 to pass. The bill will now going through the Senate. HB 3061 works to allow the courts to consider the sealing of criminal records for eight felony convictions. Passing this bill will allow certain ex-offenders to qualify for employment or housing that they previously were not eligible for due to their convictions. The eight offenses on HB 3061 bill include theft, retail theft, forgery, deceptive practice, possession of stolen motor vehicle, burglary and possession with intent. Ashor Jajou said that about a year ago, Bocanegra mentioned F.O.R.C.E to him to get his thoughts on the project. “I thought it was a great idea,” said Jajou. “There’s not enough protection for people that come out of prison. Especially with the current situation with our economy and all that, it’s even harder to get a job.” He mentioned that it’s something that can help people straighten out their lives like him and Bocanegra, who both spent time behind bars and are successfully working on their degrees. Getting an education with a record can be a challenge as well. Because of their records, some ex-offenders get discouraged and don’t even attempt to go to school. Jajou, who is now a McNair Scholar and part of the University Honors Program said, “I wasn’t going to go to school because I got into trouble again. I was fighting a court case before I even started school.” But according to Jajou, he got lucky and only received probation. Now, he says he’s done with everything related to illegal activities. 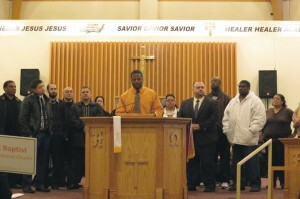 “My life will be dedicated to helping people, especially young people in gangs,” said Jajou. “I want to intervene so they don’t make the same decisions I did. So they don’t end up in a place like prison.” Through F.O.R.C.E, he’s learning the advocacy skills needed to help ex-offenders and adults. Other social work students from NEIU who are involved with F.O.R.C.E are: Floyd Stafford, a F.O.R.C.E Leader, Maggie Lozano a F.O.R.C.E member and Guillermo Tello a F.O.R.C.E member. For more information about F.O.R.C.E you can call (312) 427-4830.